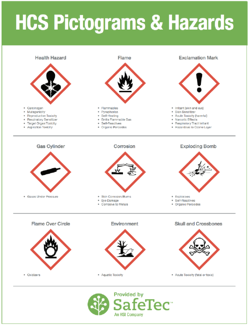 OSHA's Hazard Communication Standard was developed to ensure that information about potential health hazards from handling and exposure to chemicals and associated protective measures are disseminated. This is accomplished by requiring chemical manufacturers and importers to evaluate the hazards of the chemicals they produce or import, and to provide information about them through labels on shipped containers and more detailed information sheets called material safety data sheets (MSDS). To support OSHA's Hazard Communication Standard, SafeTec provides customizable posters, magnets, badges and stickers that you can download and personalize with your company's information. Complete the form below for access to this customizable signage.